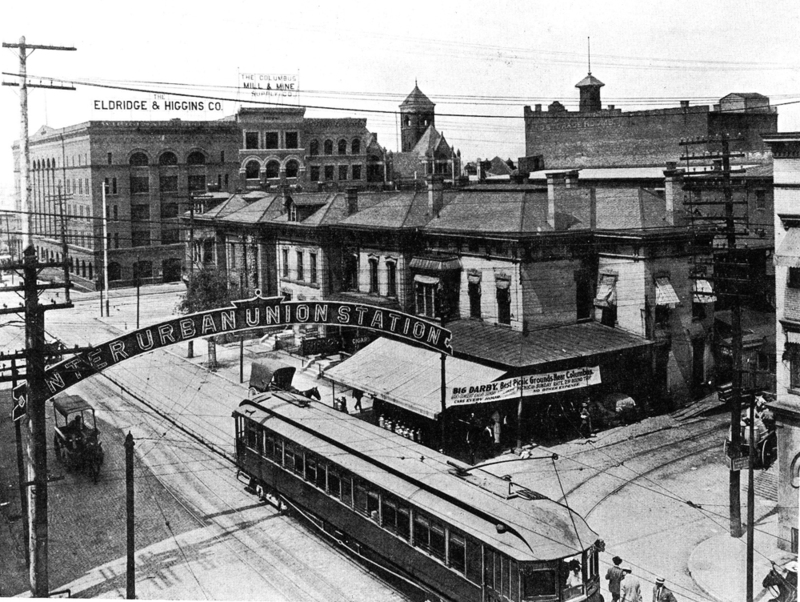 In 1901 the Interurban Union Station was in a corner row house. It was located on the north leg of the interurban loop at 36 West Gay Street between Front and High Streets. 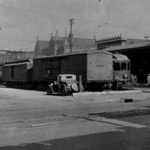 Its capacity was very limited with only a passing siding in front of the station to hold an extra passenger car and a side track to hold a freight motor or interurban box car. Photo from the 1906 Street Railway Journal. In 1900, when the interurbans were obtaining their franchises to build into Columbus, the city had a problem – how best to route the various lines into downtown Columbus. The city fathers didn’t want the interurbans on High Street. There was already too much trolley traffic on High Street. One possibility was to drop the interurban passengers off wherever the various lines crossed High Street. That idea was rejected. Instead city officials, the interurban and streetcar companies agreed to a loop around the downtown area, staying off the streets that already had streetcar service. The loop included Rich Street, Third Street, Gay Street and a combination of Water and Scioto Streets along the river. Five of the interurban lines entered the loop at various points. There were two stations on West Gay Street. The Columbus Newark & Zanesville; Columbus London & Springfield and the Columbus Grove City & Western used the Interurban Union Station located at 36 W. Gay St. The Columbus Delaware & Marion and the Columbus Urbana & Western used the CD&M's station at 100 W. Gay Street located on the northwest corner of Gay St. & Ludlow Alley. Four of the lines circled the loop stopping at their Station on Gay Street before exiting the loop where they had entered. The CU&W didn't enter the loop, but rather stopped at Gay and Water Streets around the corner from the station at 100 W. Gay Street. The Scioto Valley Traction also used the loop until 1905 when they took over the Third Street school for their depot. While the the SVT was on the loop at the southeast corner they could now loop their cars around their station for the return trip south. The Ohio & Southern line from the Hartman Farms terminated at the southern end of the High Street streetcar line nowhere near the interurban loop. The two wide gauge lines did not use the interurban loop. The Columbus New Albany & Johnstown had a station at 104 E. Long Street near Third Street. In 1905 the Westerville line used High, Town, Front and Spring Streets for their turnaround. “…more commodious and more pretentious. A big double door is planned for the front, which will be altered so that the ticket office and information bureau will set back in the room. Partitions will be removed and an additional baggage room added. A lot in the rear of the station will be roofed and 150 square feet added to the freight station. The building will be painted inside and out, new floors put in and the walls papered. The company realized that it cannot do much with the present building, but these temporary improvements will be made. “– The Columbus Evening Dispatch 11/19/1906. By 1909 the Ohio Electric had plans well under way for a new Interurban Terminal to be built on the westside of Third Street between Town and Rich Streets across from the Scioto Valley Traction’s station. 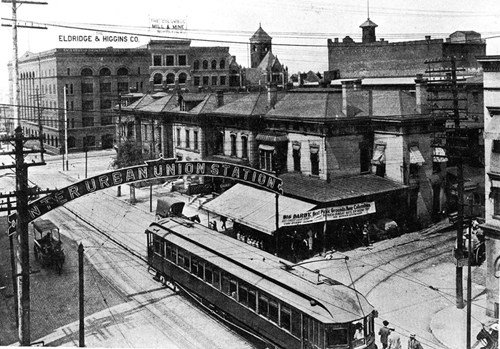 The Ohio Electric lines would move to the new station in 1912. Sometime after 1919 the CD&M moved to the new Interurban Terminal and the Gay St. standard gauge track was abandoned. The CU&W continued to terminate at Water & Gay Streets until they abandoned service in 1925. The new Interurban Terminal Station would last until 1939, the end of interurban service in Columbus.